Aphids have been detected throughout the northern counties this year, and some are asking if it will be a "bad" aphid year. I have to say it's too early to call in July, but we should know better in just a few weeks. At all of our ISU research farm locations, we can find aphids. But my summer crew is literally looking at 1,000's of plants every day. I know, who would want that job?! They are finding mostly zeros, but occasionally plants with 10-20 aphids and even a few with 100+. I really start to get interested in fields when most of the plants (>50%) have some aphids. Under ideal weather conditions, this aphid can double populations every few days. So it's important to scout often, especially after bloom, to make sure populations don't get out of control. The original sampling method is just to count every aphid on a plant and estimate the average based on how many plants were sampled. A representative sample would be about 40-50 plants for every 50 acres. As a grad student at the University of Minnesota, I thought there has to be a more efficient way to make treatment decisions for soybean aphid. 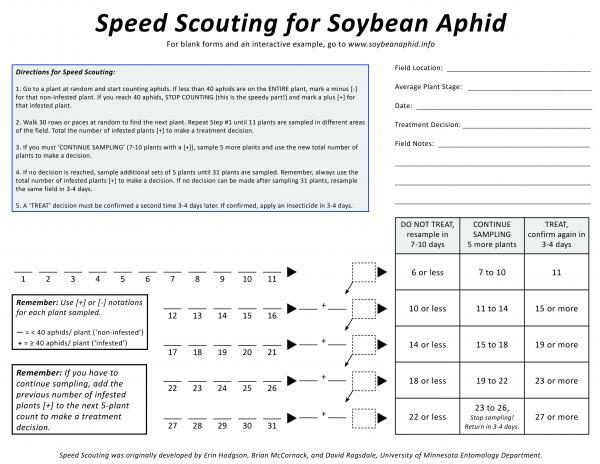 I created Speed Scouting for Soybean Aphid and encourage you to give it a try this summer! You can get black Speed Scouting forms here or you can take a look at a blank form below. In an area with persistent soybean aphid, this binomial sequential sampling method can greatly reduce the amount of time it takes to decide if an application is needed. It's sounds like something complicated, but really it should simplify your scouting life. Look at a minimum of 11 plants (maximum of 30) for aphids. If you get to 40 aphids - stop and consider that plant infested. If you never get to 40 aphids - consider that plant not infested. Most of the time, you will make a treatment decision in less than 15 minutes (hence the worksheet name!). In some cases, aphids on right on the fence of needing a treatment and I recommend scouting that field in a few days.